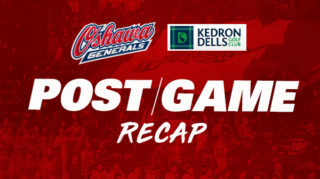 The Generals remained at home tonight to battle the Niagara IceDogs in Game 4 of the second round. After starting off the series by falling down 2-0 behind the IceDogs who claimed their two home games, Oshawa got right back into the series with a big 4-1 win at home in Game 3. 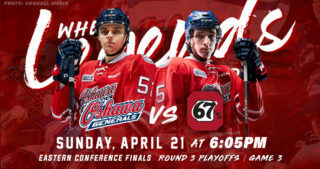 Finishing off their back-to-back home contests with Game 4 tonight, the Gens aimed to tie up the series with a win and head back to Niagara even at two wins a piece. Tonight’s contest began with a pre-game ceremony to honour Gens alumni and 1983 OHL Champions Mike Stern, Dave Gans, Norm Schmidt, Dale DeGray, and father of current Gens captain Kyle MacLean and Oshawa native John MacLean who dropped the ceremonial puck to begin the evening. The Gens opened the game with tons of physicality, laying several hits early highlighted by a big hit from Nico Gross. Despite the physical play, the IceDogs were able to control the puck and were rewarded with a goal by Matthew Philip to put Niagara up 1-0. 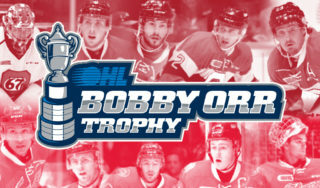 However, the Gens were able to come right back with a tally of their own off a beautiful play by Anthony Salinitri in alone to roof the puck over IceDogs goalie Stephen Dhillon and tie the game 1-1. After the goal, the Gens took the first penalty of the game for hooking to give the IceDogs a man advantage. Their powerplay didn’t last long, however, as Niagara took a penalty just seconds into their man advantage to put the play at 4-on-4. 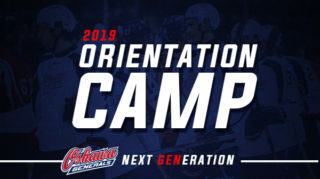 As the Gens penalty expired giving Oshawa a short powerplay, defenseman Giovanni Vallati capitalized on the chance with a point shot that beat Dhillon and gave Oshawa a 2-1 lead. With six minutes remaining in the period, the Gens were called again for a tripping penalty to put them down a man. After an incredible desperation stop from Oshawa goalie Kyle Keyser to shut down the IceDogs powerplay, Serron Noel and Kyle MacLean got a shorthanded 2-on-1 that MacLean buried to give the Gens a two-goal lead. However, Niagara was able to get one back a minute later to reduce Oshawa’s lead to 3-2 heading into the first intermission. The Gens opened the period with a dangerous chance off Noel making a beautiful move to get around Niagara’s defense and pass the puck over to Mitchell Brewer who just missed the chance. Just over three minutes into the period, the Gens received a penalty for checking from behind to put them back on the penalty kill. With a few big stops from Keyser, the Gens were able to hold off the IceDogs and kill of their penalty. Nearing the halfway mark of the period, Niagara took a high-sticking penalty to give Oshawa’s powerplay a chance. During the opportunity, Niagara goaltender Dhillon attempted to clear the puck, but it hit his own player and bounced to Nando Eggenberger who buried the loose puck to put the Gens up 4-2. Shortly after the goal, the Gens got another powerplay chance after the IceDogs took a cross-checking penalty, but also took a penalty of their own near the end of their man advantage. Killing off the remainder of Niagara’s powerplay, the Gens entered the game’s final frame with a 4-2 lead. Keyser opened the period by making a big glove stop on a Niagara shot to keep the Gens up by two. 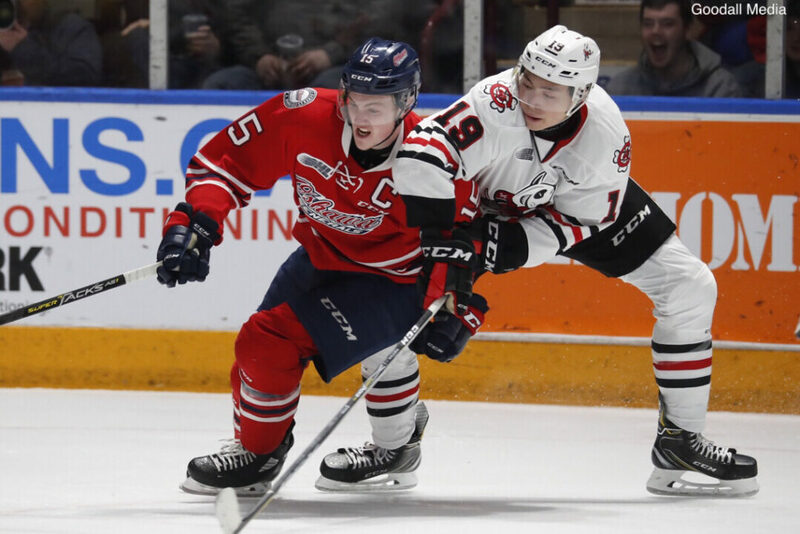 Just over six minutes into the period, the Gens rushed into the IceDogs end with Noel passing the puck to Eggenberger in the slot who ripped home his second of the game to give Oshawa a 5-2 lead. However, Niagara was able to get one right back with Jason Robertson getting the puck past the Gens to put the score at 5-3. Just past the period’s halfway point, the Gens took a penalty for hooking, but forced Niagara to take a penalty during the resulting kill. Getting a short powerplay after their infraction expired, the Gens gave up a shorthanded breakaway to the IceDogs, but Keyser came up clutch with a big save. Back at even strength, the Gens got a 2-on-1 heading into Niagara’s end that Salinitri fed to Bollers who then threw it right back to Salinitri to tip the shot in, giving Oshawa a three-goal lead. In the dying minutes of the game, several misconducts were given out after rough play ensued, resulting in the Gens getting a powerplay to finish off the game. Recording one last goal, Allan McShane potted a powerplay tally to secure a big 7-3 win for the Generals! With a clutch win in Game 4 to tie up the series at 2-2, the Gens will head back to Niagara with momentum for Game 5 on Saturday night before returning home for Game 6 on Monday. 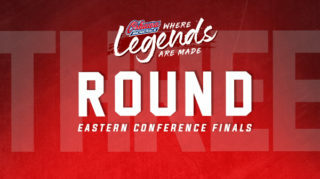 Click here to buy your Round Two tickets!